The next step has been taken in the process to implement the North of Tyne devolution deal on the back of a public consultation. Receiving a summary of the feedback – from a survey and events across the region – at its meeting on Tuesday, Northumberland County Council’s decision-making cabinet agreed to submit a detailed report to the Secretary of State. The county’s partner authorities, North Tyneside and Newcastle, took similar decisions this week too. Council leader, Coun Peter Jackson, said: “It’s no secret I think it gives exciting possibilities to Northumberland in particular. “There are set stages to go through before it becomes a reality and this is reporting back on one of those stages – the public consultation. “I attended the meeting in the Northumberland Hall in Alnwick which was very well-attended by representative bodies as well as individuals. I’m happy to report back from that event that the vast majority of comments were positive. A majority of the other cabinet members were also pleased with the feedback as well as being right behind the devolution deal itself. 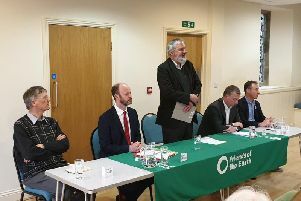 But there was one naysayer following all the positivity from the Conservative members of the council’s leadership – Lib Dem group leader Jeff Reid. He also raised concerns about the county losing its say on regional transport arrangement compared to the current set-up. But Coun Jackson pointed out that Northumberland’s fully-devolved transport arrangements will continue and the deal will give it more sway in Transport for the North – which is going to be making the major decisions going forward. Referring to the directly-elected mayor – a requirement of any deal – Coun Reid pointed out that the elections would never fall on the same day as Northumberland council elections, but would coincide with those in North Tyneside and Newcastle. “You are going to get out-voted every time,” he added. But Coun Jackson said that the mayoral elections all around the country will be on the same day – which will be a far bigger news event than any council elections.